This is the perfect gift for any golf lover, no matter their level of experience! Whether the golf lover in your life already has a set of golf clubs, or you’re looking for a more affordable gift, the CaddyCap Gift Pack is sure to please them. This gift set is perfect for anyone that enjoys the game of golf, even if they’re new to the game or they’re seasoned players. Great for any skill level, this set has everything they need to play their best, all in an organized gift set. Help your friends and family step up their game and order them this gift set to make their gameplay as efficient and stress-free as possible. They will have everything they need in one spot! 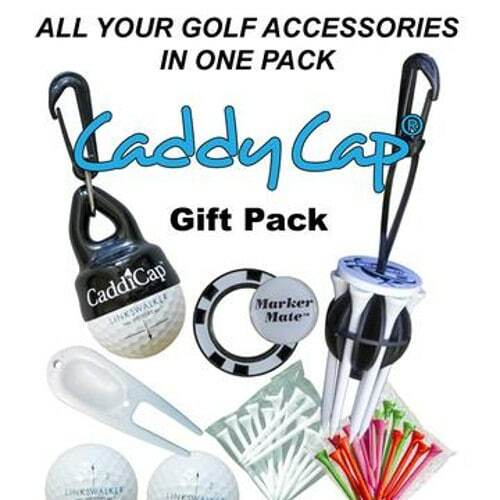 Including all of the golf accessories you want, the Caddycap Gift Pack comes with everything, from the patented tee holder that is made in the United States to the handy golf ball holder– all stored in a convenient place and ready to use. While the MarkerMate™ is included, it’s important to note that it does not come customized. If you would like each side customized, please visit the two sites listed below that perform the service. Order the CaddyCap Gift Pack for your golf-loving friends’ Christmas gifts today!